In this March 15, 2016 photo, guns for rent are on display at a shooting range and retail store in Cherry Creek, Colo. In the wake of the Orlando nightclub massacre, politicians have attempted to use the tragedy as means of garnering public support for increased gun control measures. Four pieces of knee-jerk gun control legislation were defeated in Congress yesterday, but the debate surrounding gun rights continues unabated. The new narrative is that “mass shootings,” defined by the FBI as 3 or more people killed in one incident, are at epidemic level and thus require society to increase restrictions on gun ownership as a means of saving lives and lowering the U.S. homicide rate. However, this narrative flies in the face of reality as the homicide rate in the U.S. is actually at a 51-year low, according to FBI data. The homicide rate in the U.S. for 2014, the most recent year available, was 4.5 per 100,000. The 2014 total is part of a long downward trend and is the lowest homicide rate recorded since 1963 when the rate was 4.6 per 100,000. 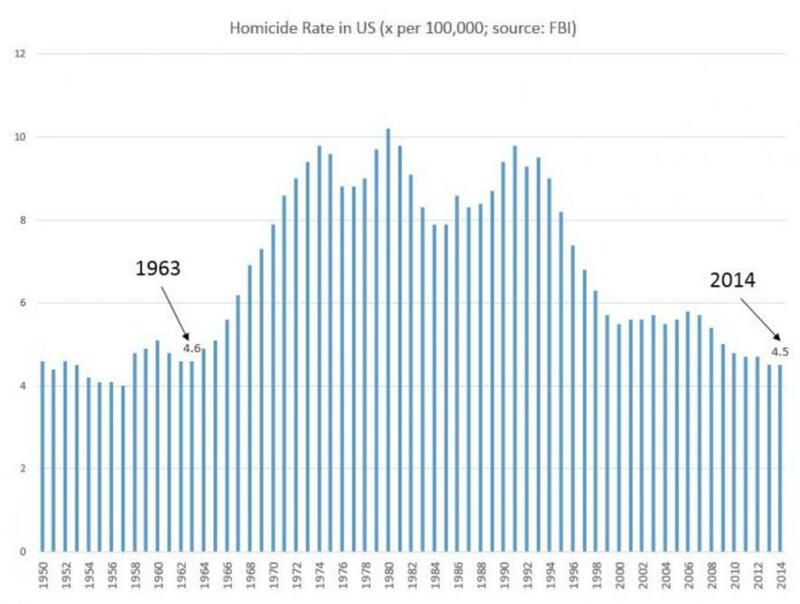 The last time the homicide rate in the U.S. was lower than it is now was in 1957 when the total homicide rate was 4.0 per 100,000. 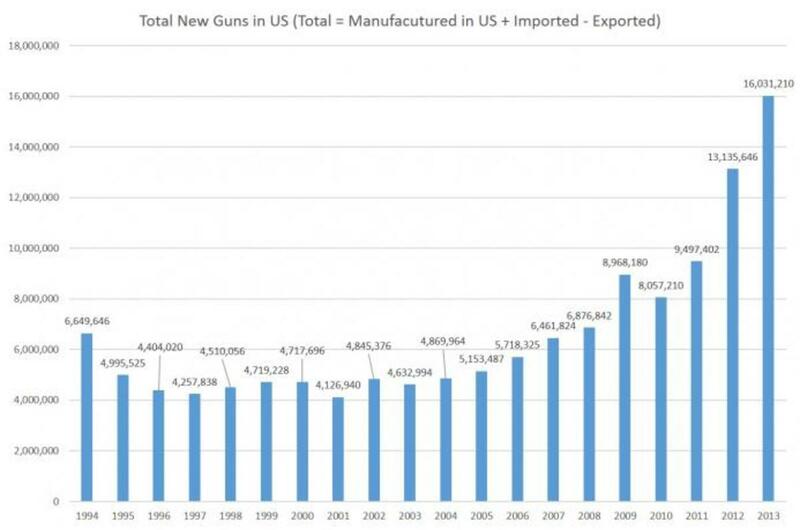 Surprisingly, most Americans are completely unaware of this information, as the media and politicians in the U.S. consistently work to create a circus-like atmosphere surrounding firearms as a means of controlling the fear-based narrative of a public need for additional gun restrictions. Contrary to what the public has been led to believe; as the homicide rate in the U.S. has fallen to a 51-year low, gun ownership has increased drastically. However one wants to rationalize this information there is one overarching theme – increased access to firearms has not led to a more violent society in the U.S. – and according to the FBI’s data, has actually correlated with a markedly less violent society as indicated by the lowest homicide rate in the past 50 years. Since the data is so convincingly clear, gun control advocates have now resorted to defining “mass shootings” as a special type of murder, and using the emotion of tragedies like Orlando, as an excuse for further regulate firearms in hopes that peoples’ knee-jerk reactions will overcome data and logic. This argument fails to acknowledge how absurd it is to attempt to imply that homicides are going up because of mass shootings when there are 49 percent fewer homicides compared to twenty years ago. This leads us to an interesting question; if the actual goal is to decrease homicides in the U.S., then why would we attempt to abolish the conditions that have strongly correlated with decreasing homicide rates (increased gun ownership) in an attempt to rid a specific variety of homicide that accounts for a very small percentage of the overall homicides in the U.S.? Regardless of Obama’s claims that “no one wants to take your guns,” there is most certainly an elite-driven agenda that is attempting to slowly regulate guns out of the American public society. The push to further regulate guns isn’t simply about decreasing homicides, as the data clearly reveals an ongoing trend of decreasing homicide rates, which begs the question; if the motive isn’t to decrease homicides, then what is the actual intent of pushing for increased gun control measure? Jay Syrmopoulos is the co-founder of TheFreeThoughtProject.com, where this article first appeared.